July 20, 2017, 9:31 a.m.
By Joseph Lichterman @ylichterman July 20, 2017, 9:31 a.m.
COPENHAGEN — Every weekday at noon, subscribers to the Danish news site Føljeton receive an emoji-filled email notification or push alert. That’s when the site publishes its daily briefing, which has evolved into its core editorial product over its nearly two years of existence. It’s published as an email newsletter, in Føljeton’s app, and on its website. The briefing features a mix of original reporting that focuses on a single topic each week (“føljeton” means “serialize” in Danish) — cultural writing, an editorial, and curated links to other outlets around the Internet. “I think of us as service providers, basically,” CEO Søren Høgh Ipland told me when I visited Copenhagen this spring. A subscription to Føljeton costs 49 Danish kroner (USD $7.55) per month. Føljeton launched in late 2015. Its cofounders — journalists who’d worked at traditional Danish news organizations — wanted to try and create an innovative mobile-first news outlet. 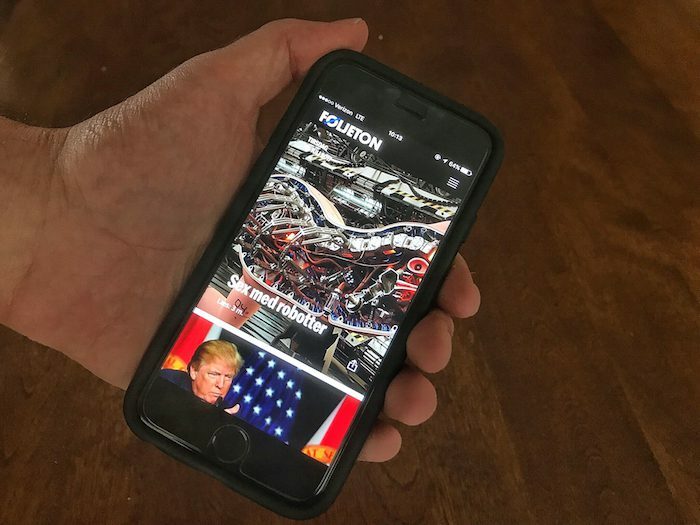 When it debuted, the newsletter was an afterthought, which was mostly just used to distribute the site’s primary output — mobile-first card based stories. Each card told took up one or two screens and contained up to 200 words, and they were created with the idea that they could be read independently or as part of the larger overall story. Føljeton published five serialized stories per day, and each series continued as long as needed. By May 2016, six months after launching, Føljeton decided to change course. The serialized series were expensive to produce, and it took time for writers to learn how to adapt their style to the format. The format also confused readers, said editor-in-chief Oliver Stilling, one of the site’s cofounders. 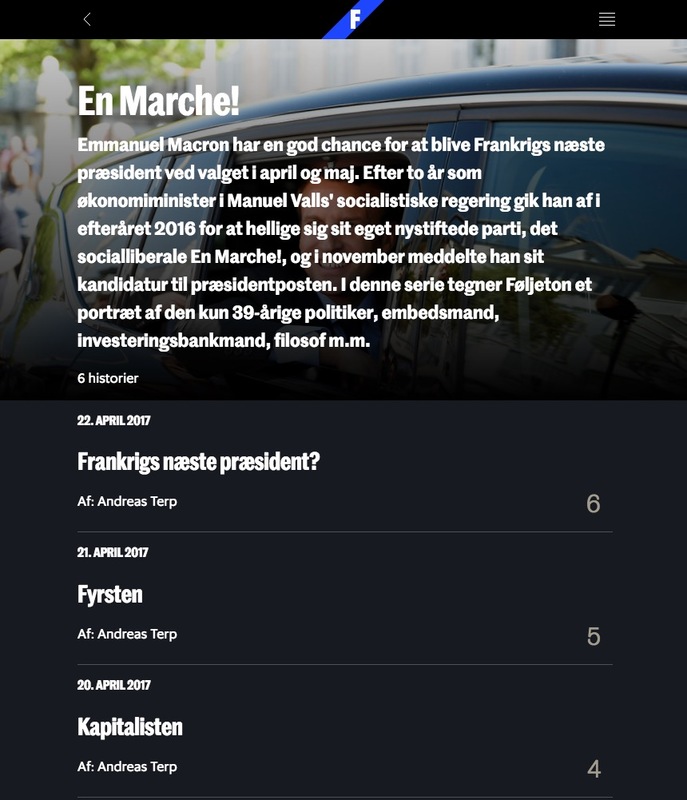 Føljeton moved its reported features to the weekend to create a weekend magazine of sorts while expanding the curated weekday newsletter that was designed to serve as a guide to the news. It also announced at the time that it would produce one large-scale reported series each month. In January, it shifted to its current format, which spreads original reporting on a single topic throughout the week — with an expanded weekend edition published on Saturday — and puts further emphasis on the newsletter-based briefing format. Recent series, for instance, focused on an asylum center in Copenhagen and on French president Emmanuel Macron in the lead-up to the French election this spring. 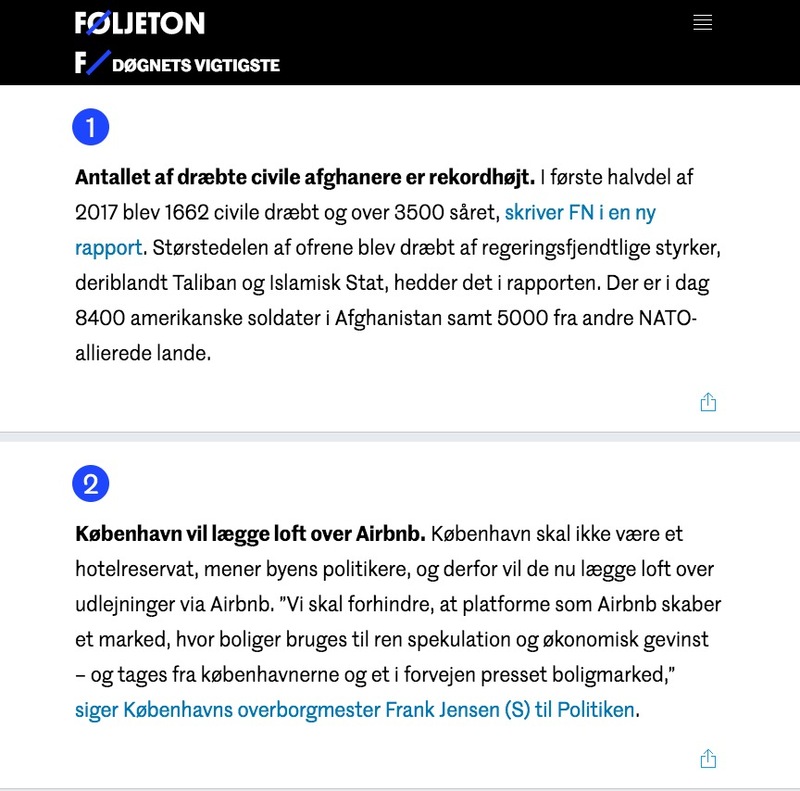 Føljeton is now considering further altering its editorial format by moving from weekly topics to an approach modeled after Quartz’s obsessions. Instead of covering just one topic per week, it could have a series of issues that it tracks and covering regularly. Føljeton now has 5,500 paying subscribers, and Ipland said the site has grown by 15 percent or so since May when it undertook a redesign of its landing page and pitch to potential subscribers. It’s also struck deals with an unemployment benefits company and the Danish architects’ union to provide bulk discount subscriptions to their members. Ipland said the site is also in talks with other organizations to reach similar deals. The site is still not profitable. It needs about 8,500 subscribers to break even. Føljeton received a three-year, 4.4 million kroner (USD $680,000) grant from the Danish government, and it’s additionally raised a similar amount of funding from private sources. Ipland said the site still views subscriptions as the ultimate key to its success. The team plans to keep simplifying its main product, while potentially introducing other verticals such as a local Copenhagen site or a literature-focused site that could also attract sponsors or other types of funders. In addition to its core briefing product, Føljeton would ultimately like to take on bigger projects that bring attention to issues that the site’s team cares about. Over coffee this spring, Stilling excitedly described a number of initiatives the site has thought about pursuing, such as holding a gay pride parade in a small Danish fishing village, building an asylum housing center based on designs a right-wing politician created while she was an architecture graduate student, and auctioning off items used by celebrities that are mentioned in stories. But before it can effectively take on projects like those, Føljeton says it needs to continue to build up its core subscription business and bring in more revenue. And while these larger undertakings may seem like a departure from Føljeton’s bread and butter coverage, Ipland sees them as being complementary. POSTED July 20, 2017, 9:31 a.m.
Lichterman, Joseph. "This Danish startup evolved into a “newsletter company” because that was what its readers wanted." Nieman Journalism Lab. Nieman Foundation for Journalism at Harvard, 20 Jul. 2017. Web. 19 Apr. 2019. Lichterman, Joseph. "This Danish startup evolved into a “newsletter company” because that was what its readers wanted." Nieman Journalism Lab. Last modified July 20, 2017. 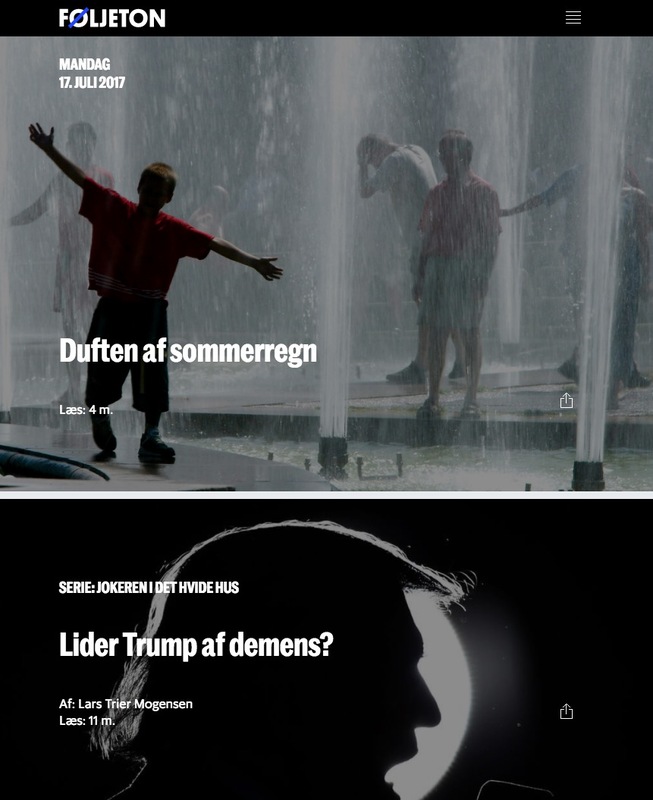 Accessed April 19, 2019. https://www.niemanlab.org/2017/07/this-danish-startup-evolved-into-a-newsletter-company-because-that-was-what-its-readers-wanted/.